21 Competition: Your chance to win a pair of WD KEL84 amplifier in this month's competition. 31 Mail: Seven pages of your views and opinions. 40 Subscriptions: Ensure your copy every month and save money too! 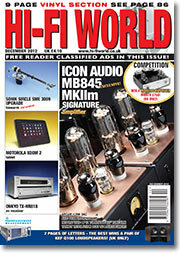 61 World standards: Updated guide to the latest and greatest hi-fi hardware on sale. 68 Audiophile CD: Paul Rigby rounds up the latest releases. 75, 77, 79, Opinion: The team get to grips with matters music, hi-fi and life! 18 Tannoy Revolution DC6T SE: Jon Myles listens to a new, affordable Tannoy. 46 Akkus v1 Bookshelf: Paul Rigby auditions a stand mount loudspeaker with bass. 12 Icon Audio mb845 MKIIm Signature: Noel Keywood enjoys one the best amplifiers around, in its latest form. 52 Moon 810lp: Noel Keywood and Rafael Todes on an �8k+ phono stage from Canada. 81 Onkyo TX-NR818 Surround Sound Receiver: Martin Pipe enjoys a complex but impressive AV receiver. 22 Motorola Xoom 2: Paul Rigby and Noel Keywood look at a tablet with audio pretensions. 28 Arcam R Link DAC: Jon Myles listens to a lovely little budget DAC. 39 Tivoli Model One BT: Paul Rigby tunes in a Bluetooth equipped vhf radio. 42 Epiphany E-DAC: Paul Rigby auditions a tiny DAC. 51 Bayan 3 iPod Doc: Paul Rigby checks out the latest iPod dock. 27 Mains cable r us � no.11, Asylum, Ultimate, mains cables :Paul Rigby listens to a brace of mains cables. 56 Jumble Of Joy: Martin Pipe scours an audio jumble for old classics -- and finds them! 70 Olde Worlde Philips 9710M: Haden Boardman explains what lies behind this full range drive unit. 109 Oyaide HPC-62HD cable/epiphany Atratus cable: Paul Rigby loves his cables and auditions some good ones here. 89 Inspire Vivid LP12 turntable + Ortofon TA-110 Arm: Rafael Todes spins an interesting combo from inspire, Linn LP12 with 13in Ortofon TA-110 arm. 93 Classic Cut: Paul Rigby on merle haggard, �the troubador'. 95 Avid Pellar: Paul Rigby auditions the latest budget phono stage from avid. 99 Sonik Sirclesme 3009 Upgrade: Tony Bolton tries an upgraded classic arm. 106 Classifieds: Two pages of second-hand bargains. 110 Dial-a-Dealer: A comprehensive guide to UK hi-fi retailers. 114 Classic Cuts: Paul Rigby spins Frank Zappa's Hot Rats album.